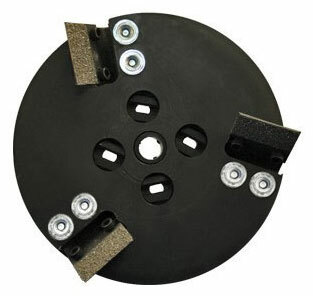 Here you will find all of your Concrete Floor Grinder Parts & Accessories. 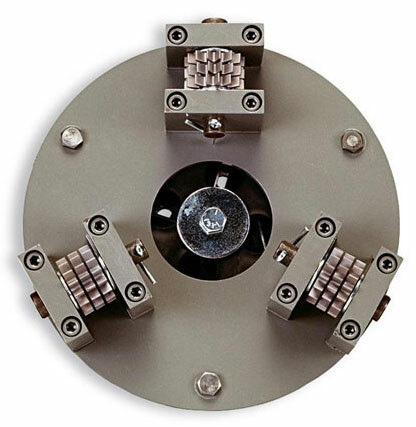 We carry a wide variety of replacement diamond heads and repair parts. If you can't find something that you're looking for, please give us a call at 1-800-227-8479. The Onfloor Red Diamond Attachments are for new or old concrete, removes thin mil coatings, removes latents containments, and opens pores in unfinished concrete. Estimated coverage for a set of 3 attachments is 8000 sq. ft. Also used for abrading existing concrete for recoat. 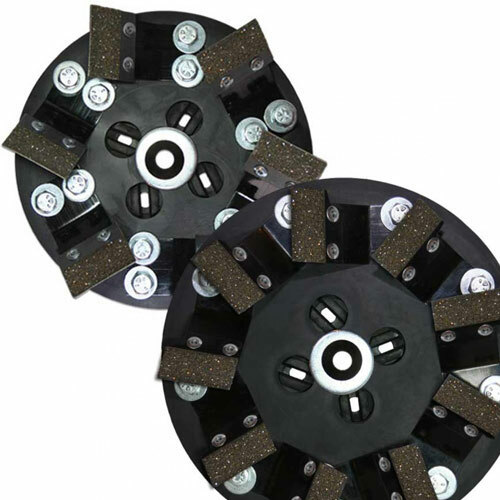 The Onfloor Carbide Scarifier Attachments are for removal of thin set coatings from concrete floors. 3 to a set. 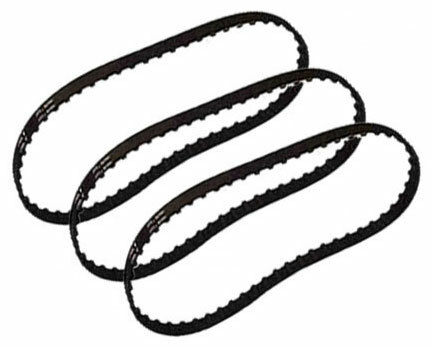 Carbide Scarifier Replacement Kits are also available as a special order item. The Onfloor 8 Way Carbide Scraper Attachments are for removal of mastics from floors without creating scratch patterns. 3 to a set. The Onfloor Diamabrush™ Mastic Removal Tool is designed to remove stubborn coatings from concrete, such as mastic, carpet or tile adhesive, thin-set and thin mil coatings like urethane or paint. No need to waste time and money on heavy grinding equipment or harmful chemicals. 3 to a set. • Uses diamond coated blades to grind tough coatings away. • No dangerous and volatile chemicals are required. • Simply apply water to eliminate dust and to flush debris away. • Money saving replaceable blades. • Designed to fit a wide variety rotary flooring machines. • The Diamabrush™ Mastic Removal Tool has limited surface contact during use to retain sharp cutting points over the life of the tool. 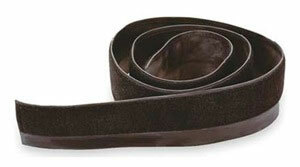 • Removes mastic, carpet or tile adhesive, thin-set and thin mil coatings like urethane or paint. • Rigid, exposed diamond cutting surface creates a level floor with normal use. • Removes most unwanted low spots within the concrete. • Low profile design enables tool to travel over gaps in the concrete. The Onfloor Diamabrush™ Concrete Prep Tool has a patented diamond 50/60 grit metallic blade. The blade is then bonded to metallic backing and assembled to flexible, spring-steel blade. The flexible blade allows the diamond to remain in constant contact with the floor, maximizing the tools effectiveness. Need to re-coat an epoxy concrete floor? This tool abrades existing epoxy floors, effectively preparing it for the re-coat application. 3 to a set. • Abrades existing epoxy coated, painted or bare concrete floors. • Use with water to eliminate dust and to flush debris away. • The Diamabrush™ Concrete Prep Tool has limited surface contact during use to retain sharp cutting points over the life of the tool. 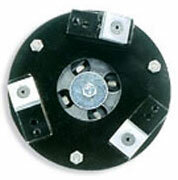 Weights for Onfloor surfacing machines. 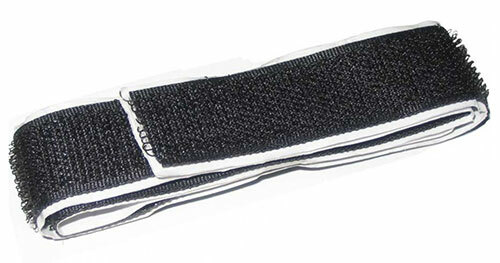 Replacement Velcro Backing Strip for Dust Skirt for Onfloor Floor Grinders.